Since the spring of 2011 Syria has been a country intent on destroying itself. What began as peaceful demonstrations, against the leadership of President Bashar al-Assad, soon became a national uprising to overthrow the dictator. With millions displaced, and hundreds of thousands dead, it is a humanitarian disaster on a scale the world has not seen in decades. In the midst of this turmoil, Paddy Vipond, a young British volunteer, ventured across the border from Turkey to see the situation for himself, and to help those that were suffering. This honest and insightful account of the short time he spent in Syria is a thought-provoking and candid look at a world many of us have turned our backs on. Armed with nothing but a pen and paper, and in the company of a man he had met the day before, Paddy embarked on a journey that would change his life forever. 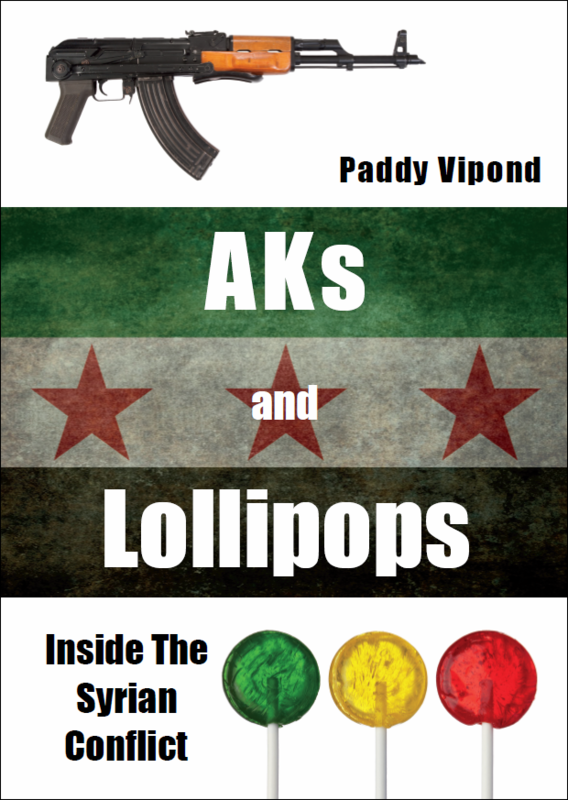 Detailing remarkable stories, and written with warmth and humour, AKs and Lollipops places us alongside Paddy as he parties with Free Syrian Army soldiers, rides tanks with northern rebels, and gets bombed by Assad’s military. From his initial illegal entry into the country, right up to his final encounter with ISIS, Paddy paints a picture which is truly impossible to ignore. Paddy Vipond is a BA Hons graduate of the University of Brighton with a degree in War, Conflict and Modernity. During a volunteer placement in Turkey he established Do What You Can, a small aid giving project for displaced Syrians and refugees. When the project was able to go no further he returned to the UK and began studying for an NCTJ diploma in Journalism. Paddy writes articles for numerous publications, across a broad range of topics, and has been featured in The Guardian, Psychology Today and Skin Deep Tattoo Magazine. As well as writing, and studying, he also works in the non-profit sector for a renewable energy charity based in Brighton, UK. His frustration at the state of the world is matched only by his desire to change it.